Robert Carter Olson was reappointed to the Superior Court in Pinal County by Governor Doug Ducey in September 2018. Judge Olson was born, raised and educated in Illinois, earning a Bachelor of Science Degree from Elmhurst College, a Juris Doctor Degree from Loyola University of Chicago, and holding a certificate as a Certified Public Accountant from the University of Illinois. In 1990, Olson joined the Pinal County Attorney's Office as a criminal prosecutor and served in various capacities until being appointed as County Attorney by the Board of Supervisors in 1996. He was elected to that position in 1996 and re-elected in 2000 and 2004, serving more than eleven years as County Attorney. In 2007, Olson was first appointed to the Superior Court by former Governor Janet Napolitano, where he served primarily on the Civil and Probate Benches. 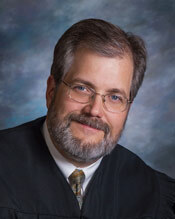 During his last five years as a Superior Court Judge, Olson also served as Presiding Judge of Pinal County. Olson retired from the Bench at the end of 2013 when all three of his children were in college, but he continued to actively serve as a retired judge in several counties and as a judge pro tempore with the Court of Appeals, Division One. He returned to the Bench in Pinal County in 2016 as a full-time Commissioner and was reappointed to the Superior Court by Governor Douglas Ducey in September 2018. Olson is again assigned to the Civil and Probate Benches, and he performs an administrative function as the Billing Special Master. Beyond judicial service, Olson was twice appointed by the Governor and twice confirmed by the Arizona Senate to the Board of Trustees (known as the “Fund Manager”) of the Public Safety Personnel Retirement System, a multi-billion dollar pension system that covers all police, firefighters, elected officials, judges, correction officers and, most recently, Arizona’s probation officers. Olson served on the Board for more than seven years, including approximately five years as Chair, focusing on strengthening governance and investment practices, as well as shifting the investment policy toward a global perspective. Olson’s public and community involvement have included: Chair and Commissioner of the Arizona Criminal Justice Commission; Vice Chair and Councilmember of the Arizona Prosecuting Attorney’s Advisory Council; Treasurer of the Arizona Democratic Party; Board Member of the Arizona Auto Theft Task Force; and Board Member of the National District Attorneys Association. He has received numerous awards and recognitions for his civic and professional activities.